Crossover and SUVs are the largest and most popular vehicle segments representing the whole automotive industry these days. While sedans and hatchbacks have their own charm, most people would always go for an SUV or a crossover. Perhaps a decade ago, one would have been referring to the more fuel-efficient hatchbacks or compact sedans for that matter, but with more flexibility and fuel-efficient engines, utility vehicles are fast becoming the peoples’ favorite family car these days. Ask any auto enthusiast what type of vehicle they like to ride and most will say they’d love to ride an SUV or a crossover any time of the day. No wonder SUV sales have been increasing at an unprecedented rate for the last couple of years. The question is: what’s the difference between the two? SUV, short for “Sports Utility Vehicle”, is a vehicle classification similar to a multi-utility station wagon or an estate car that’s usually featured with four-wheel drive for both on-road and off-road driving. It’s a powerful vehicle equipped with all the sturdy features to be driven over rough grounds. The name doesn’t say a whole lot about the vehicle though. Generally, SUVs have a “body on frame” design meaning the body and the frame are built separately and then assembled later. 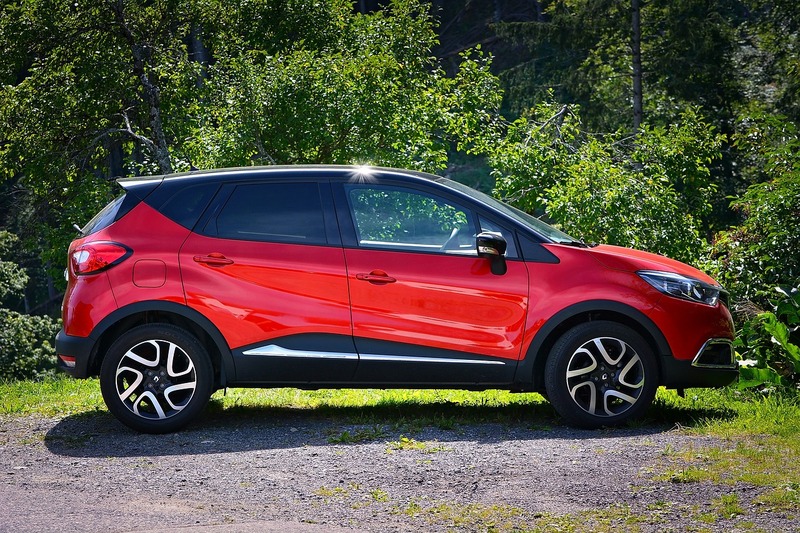 They are specifically designed to withstand tough terrains and harsh conditions while being comfy enough to be a perfect family car at the same time. They also have spacious interiors and large boot space accompanied by a sloping back to easily accommodate five to seven people. The term SUV, however, is used to refer to both SUVs and crossovers. Back then, SUVs used to be all muscle with more off-road capabilities fitted with four wheel drives. From an engineering point of view, they were high-riding vehicles with tall interiors and high seating position to mimic the built of a pick-up truck. Early SUVs were believed to be the descendants of the more rugged and utilitarian light-wheeled military vehicles that were intended to carry soldiers over rough terrains. It wasn’t until the 90’s that SUVs became the vehicle of choice in America and Asia. SUVs have come a long way from an expensive choice of car to a more standard and economical family car. The most popular SUV brands are Jeep, Land Rover, Hummer, Chevrolet, etc. Crossover, as the name suggests, is a crossover between a full-fledged sedan and a compact SUV to resemble an all-purpose minivan. 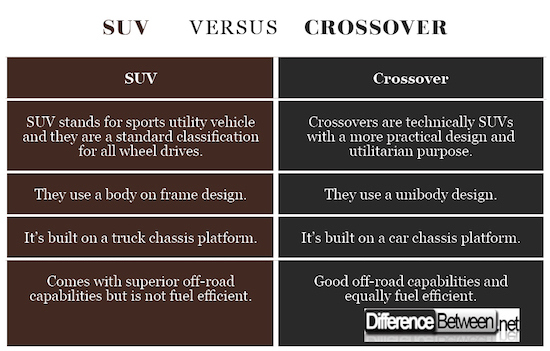 Crossovers are more like compact SUVs except they are built on a car chassis platform with unibody architecture. Unlike SUVs, the body and the frame of a crossover vehicle are built as a single piece. The best thing about unibody designs is that they are much lighter which accounts for better fuel efficiency and better fuel efficiency means agility. Crossovers are a perfect family car with all the bells and whistles of a sports utility vehicle. The term crossover came as a better alternative to a full-fledged SUV less than a decade ago but has evolved into something more utilitarian. They have an edge over the old school SUVs in terms of convenience and capabilities. SUVs were initially popular for their size and high seating position and people would actually feel safe in these giant beats, but they were heavy and anyone could attest to the limited handling capabilities of one. This is where crossovers come to the picture. They are practically compact SUVs with combined features of fuel-efficient hatchbacks (or sedans) and rugged off-roader SUVs. To overcome the limitations of SUVs, automakers have started making SUV-like vehicles called crossover that would not only be easier to handle but also comfortable enough for long rides yet equally fuel friendly. From the structural rigid SUVs to performance-driven sedans, crossovers have come a long way to become the perfect go-to family car. While the terms SUV and crossover are often used interchangeably within the automotive industry, the difference between the two is quite subtle. SUVs are generally four wheel drives with exceptional off-road capabilities to be driven over tough terrains under the harshest conditions. Crossovers are technically compact SUVs with the combined features of a full-fledged SUV and the convenience of a sedan. On the surface, they all look just the same. While crossovers are technically SUVs but not all crossovers are four wheel drives. 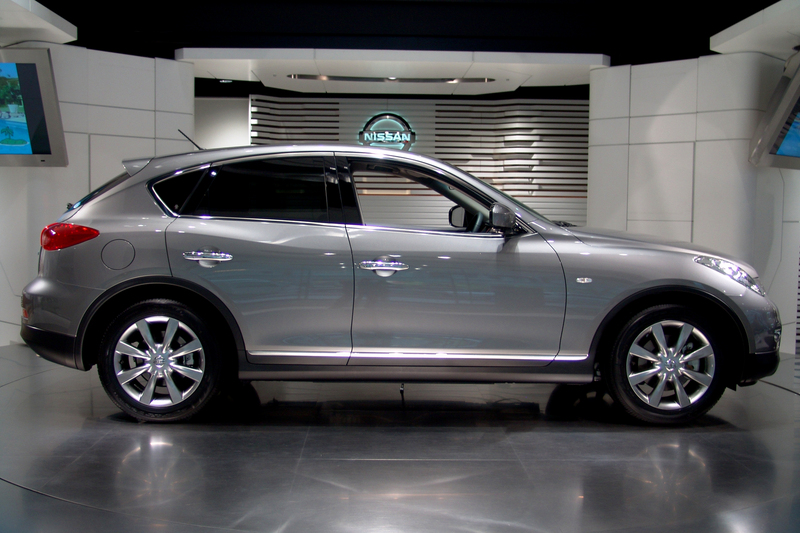 A crossover is built on a car chassis platform, while an SUV is built on a truck chassis platform. SUVs mimic the built of a station wagon, while crossovers are more like minivans. Both SUVs and crossovers possess almost similar capabilities in terms of convenience and ride quality, but SUVs are more heavy-duty with a slight rugged architecture. SUVs boast a “body on frame” architecture meaning both the body and frame are built separately and then assembled later, while a crossover is usually a unibody design meaning the body and the frame are built as a single piece. SUVs are heavy duty vehicles with superior off-road capabilities and exceptional handling. An SUV is nearly anything that come with all wheel drive and raised ground clearance and is intended for traversing the rough grounds even in the harshest of conditions. Crossovers are more practical in design intended to become the perfect go-to family car. The term SUV is often used in conjunction with crossover, but they are quite different in terms of ride quality and convenience. While SUVs are generally heavy duty vehicles with exceptional off-road capabilities intended to be driven over rough grounds in the harshest of conditions, crossovers are an all-purpose utility vehicle tailor-made to fit every budget and style. SUVs are built on a truck chassis platform based on a “body on frame” design meaning the body and the frame are built separately. Crossovers, on the other hand, are built on a car chassis platform based on a unibody design meaning the body and the frame are built as a single piece. Sagar Khillar. "Difference Between an SUV and Crossover." DifferenceBetween.net. January 31, 2019 < http://www.differencebetween.net/object/auto-object/difference-between-an-suv-and-crossover/ >.